Learn how to quilt from start to finish! Using your own choice of fabrics (we'll help you! 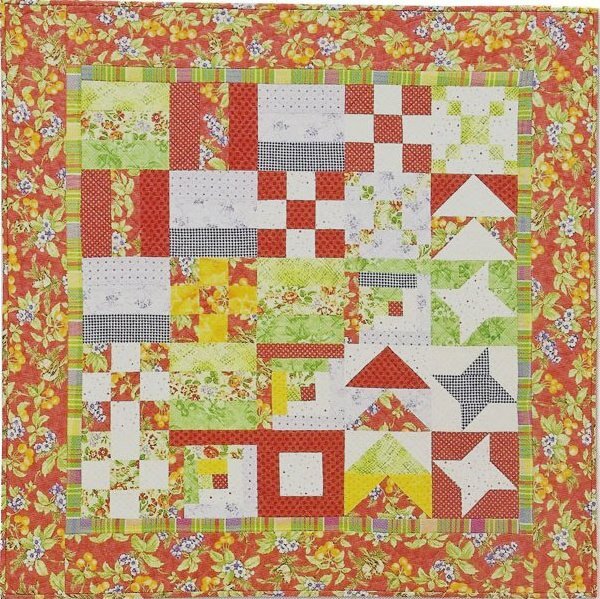 ), make this small sampler quilt. Learn how to make a nine-patch, log cabin, half-square triangles, and flying geese; learn how to machine quilt with a walking foot and a freemotion foot, learn how to measure for borders, and how to bind your quilt. This project is small enough to finish. Learn how to cut with a rotary cutter and ruler, how to make a true 1/4" seam, measure and cut borders, how to layer your layers, how to quilt, and even how to bind! Janet will tell you all the hints, tips and tricks, and show you lots of gadgets to help you along. You'll make a sampler quilt. We will cut this quilt in class! 1/3 yard of 8 to 10 fabrics, the more you have the better your selection. Thanks for purchasing your materials at Asheville Cotton Co. Your business enables us to continue offering great classes!